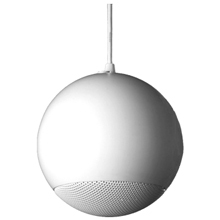 This spherical ceiling loudspeaker is a well-shaped, round loudspeaker made of powder-coated metal in RAL 9010, with a high efficiency and a high-quality 130 mm full range loudspeaker chassis and a ferrite magnet. This loudspeaker can be installed wherever there are no false ceilings. The metal grill is fitted directly and it is adjusted to the spherical design and provided with a 2 m connection cable and a white canopy.